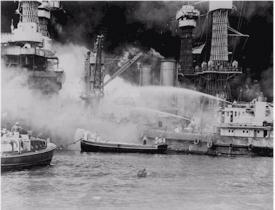 WASHINGTON (CNN) -- Us Navy officials reported earlier today, that on Sunday morning a number of Navy war-ships in the American Settlement of Pearl Harbor, were suddenly discovered to be sinking. Unnamed sources blamed the incident on a training exercise being conducted by the Japanese Navy nearby. In Tokyo Japanese officials said that while some civilian fishing boats were in the area , they were unaware of any unusual activity. They repeated their commitment to the peace process and said that any violence was the direct result of continued American aggression in the South Pacific. They went on to emphasize that only peaceful negations based on a U.S. acceptance of Japan's leading role in Asia could reduce the tensions between the two countries, and called for an international inquiry into the matter. U.S. President Roosevelt, who leads the hard line Democratic party, accused the Japanese Navy of a Deliberate sneak attack on the American fleet. He said thousands of American soldiers had been killed on a "Day that will live in infamy." There has been no independent confirmation of those figures, which respected Japanese sources say are greatly exaggerated. And because of the belligerent tone of the Right Wing American President's remarks many Japanese now consider him to be a war criminal. The region in which the US has built hundreds of illegal settlements, since its unilateral annexation of Hawaii, has been a flash point since U.S. Admiral Perry's visit to Japan in 1853. A visit which some Japanese consider to have been a defilement of holy Japanese soil by an uncivilized foreigner..
Japanese civilians have repeatedly called for spontaneous days of rage to protest the intrusion by the American military which is against international laws. Since Perry's visit more than 120 million Japanese have died, many of them children, and more than 73 typhoons, and 213 earthquakes have struck the island nation of Japan. No earthquakes are reported in the United States. © 1941 Cable News Network LP, LLLP.